Indoor Hurling Training on Friday 30th March at Friary 6.00pm - 6.45pm. They will then take a break over Easter and resume out in the pitch on Saturday morning 21st April. Can we ask all parents to reply Y or N to the texts for games once they are sent out. This will help our coaches plan for the games. We played in the second round of the U14 Football last Friday evening. Our lads played very well and went on to record a good win. Panel: Aaron Beresford, Jack Kiely, Shane Ahearne, James Beresford, Padraig Moore, Bearach Moore, Gearoid Hallinan, Tom Looby, Neil Montgomery, Patrick Power, Ryan Daly, Darragh McGrath, Tony Collins, Sean Whelan Barrett, Sean Crotty, David Montgomery. On Sunday both our under 13 teams played at home against the Brickey’s and Kilrossanty. Both games were played at the same time. The team against the Brickey’s played well and were always in control. Panel: Aaron Beresford, Jack Kiely, Shane Ahearne Padraig Moore, Bearach Moore, Gearoid Hallinan, Tom Looby, Sean Whelan Barrett, Sean Crotty, David Montgomery, Tommy Walsh, Fionn Gibson Kiely, Shane Kiely, James Riordan, Daithi Brunnock, Johnny Treen, Mark Towmey. The second team played Kilrossanty this was a much better game. While we got off to a slow start and we were 1 -6 to a 0-1 down at have time. The second half we started much the stronger and got 2 good quick goals to put us back in the game. For the last 15 mins there was only one or two pts between the two teams and both teams had a great battle to the final whistle, where we lost out. Final score was 3-4 to 2-9. It is games like this that really show the benefit of having two teams in this Championship where 32 players play under 13 football Sunday morning for the club all getting a lot of game time. Panel: Cain Power, Jack Dwane, Paddy Dwane, John Power, Michael Lenihan, Sean Kent, Fergal Roche, Cian Fagan, Jamie Walsh, Ben Flynn, Jake O’Riordan, Ruairi Cusack, Meldan O’Dwyer, Michael Kiely. Well done to Scoil Mhuire NS who recently won the football and hurling mini sevens tournament in Bushy Park. The lads put on some great displays of hurling and football on the day. Well done to all the players and teachers involved. Our annual bag pack will take place in Garvey's Super Valu on Thursday 5th Friday 6th & Saturday 7th April. This is a vital fundraiser for the club and volunteers are needed for two hour slots over the 3 days. Any help would be much appreciated. Please contact Carmel on 0872598923 as soon as possible. Back Row (L to R): Nacko Ryan, Paddy Needham, Jimmy Donovan, Mickey Morrissey, George Donovan. 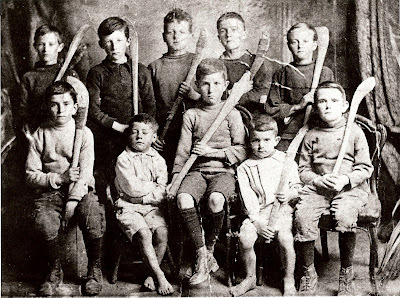 Front Row (L to R): Tommy Whelan, Paddy (Fogger) Morrissey, Tom Burke, Gus Whelan, Ned Whelan. This week's photo takes us back almost 100 years, prior even to the founding of the Abbeyside Club. Note the almost hockey-like hurleys used by the young Village lads at the time. Many of the family names mentioned here played a significant role in our club down through the years and indeed some are still involved to this day. Our popular Jack the Joker Fundraiser will continue this Sunday night in The Stables Bar where the Jackpot will be €4,910. This week Kathleen Shields was drawn out of the drum but did not find the joker but did win €50 while Joe Mulcahy and Maurice O’Donnell won €25. We appeal to all our supporters to continue purchasing the tickets as the funds raised will go towards our ongoing development works at the club grounds. Our club bingo will move to The Park Hotel this Sunday at 3 pm where will stage a Monster Bingo with €3,000 prize fund. On Friday night last we took on The Nire in the Western Semi Final and after a slow first half performance we ran out comfortable winners in the second half to qualify for the final which took place on Monday against Dungarvan in Fraher Field. The game was extremely competitive and the teams were deadlocked at the end of normal time. The players displayed great courage to win the game in extra time and win our first title since 2007 at this grade. TEAM: P. CASHIN, D. DEE, D. HENLEY, B. McCULLAGH, N. DEE, M. POWER, C. HICKEY, M. O’HALLORAN, R. SHEEHAN, S. CROTTY, J. POWER, D. COLLINS, E. COLLINS, R. DUNFORD, S. O’DONOVAN. SUBS: B. LOOBY, C. KINDREGAN, J. LEACY, D. MORRISSEY, G. MORRISSEY. The next meeting of the club committee will take place in The Parish Office on Thursday night March 22nd at 8 pm. Under 7’s and under 10’s will be training in the field on Saturday morning, 10.30-12.00. Teamers will be sent out. Just to say well done to all of our young members who took part in the St. Patrick’s Day parade on Saturday. There was a great turnout on the day and it was fantastic to see so many involved. Well done to all. Membership forms and Code of Conduct forms for most age groups are been given out during the week. Coaches are asked for their assistance in getting this done in an orderly and efficient manner and parents/guardians and players are asked to sign, complete and return as soon as possible. Congratulations to all the boys and girls Scoil Mhuire who made their confirmation recently. Many thanks to the teachers who helped make the day a great success. Just to remind everyone to get walking on Monday evenings at 6.30pm as we are coming into the last few weeks of the walk. Participants fill in an envelope at Centra and show whether they wish to contribute to the Juvenile GAA or SERT. The fee is €1 per mile and the walk is from Centra, out the New Line, down by St. Augustine’s College in Duckspool and in the Burgery and back to Centra, which is just about 2 miles, so the cost per walk would be €2. The organised walk takes place each Monday at 6.30pm but people can walk anytime they wish. We will keep a record of the people walking and a chart will be available after a few weeks. That’s the reason for writing your name on the envelope. The walk has been a great success for the juvenile club and its various other beneficiaries thus far and we urge people to get out in force for the final few weeks. Well done to all the girls who walked in this year’s St. Patrick's Day parade. Ye all did a great job and also managed to win a prize. Ye are good singers as well as camogie players. Training starts again this coming Friday evening 23rd march 6.30 to 7.30 at pitch for all age groups. As the evenings get brighter training will be from 6.30 to 8.00. Joker tickets can be purchased from Claire or Carmel the money raised goes to improvements to club grounds and as we return outdoors it will be evident for all to see the improvements that have taken place. New members are always welcome from age five and up. Congratulations to Ballinacourty U21 Footballers who won the Western 'A' title today after a hard fought extra time victory over old rivals Dungarvan. The score at full time was 0-10 apiece. Ballinacourty played superbly well in extra time to win on a scoreline of 1-16 to 0-11. Abbeyside / Ballinacourty Camogie Club took part in the St. Patrick's Day Parade on Saturday last. Below are some pictures of the players and mentors enjoying themselves along the route. 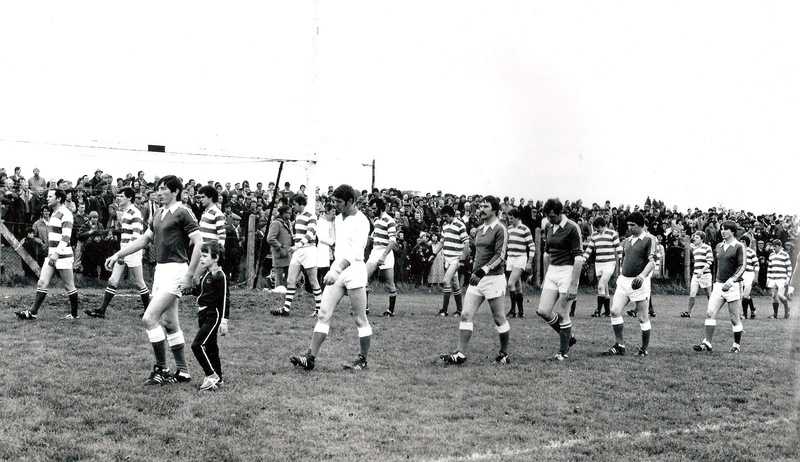 This week's photo shows the Ballinacourty and Ardmore teams parading around the Fraher Field prior to the 1981 County Senior Football Final. Ballinacourty took the honours on a scoreline of 2-14 to 0-6 to claim their third senior title in four years. Saturday 17th March next, our club are taking part in the St Patrick’s Day parade. Teamers will be sent out to participating age groups (ages 7 -12). Just to remind everyone that we are still walking every Monday evening at 6.30pm. Participants fill in an envelope at Centra and show whether they wish to contribute to the Juvenile GAA or SERT. The fee is €1 per mile and the walk is from Centra, out the New Line, down by St. Augustine’s College in Ducks Pool and in the Burgery and back to Centra, which is just about 2 miles, so the cost per walk would be €2. So far, over €700 has been collected for our club, well done and thanks to all..... and keep on walking! Colaistí na nDéise were defeated on Saturday last in the Quarter Final of the All Ireland Colleges by Kilkenny CBS. The lads battled bravely throughout and were unfortunate to lose after extra time. In spite of this, the lads have had a fantastic year, winning the Harty Cup. Well done to Eamon, David, Evan, Brian and Laurence for their achievements throughout the year. Last Sunday our Under 13 footballers travelled to play Lismore. Our lads played well to run out winners. Both under 13 teams are out again on Sunday 25th at home to the Brickeys and Kilrossanty. 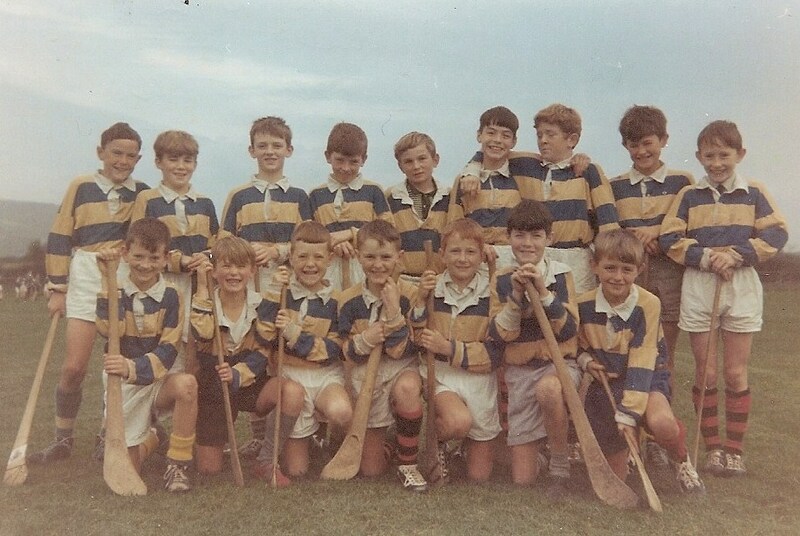 Under 13 team: Gearoid Hallinan, Aaron Beresford, Tommy Walsh, Shane Ahearne, Fionn Gibson Kiely, Padraig Moore, Bearach Moore, Sean Whelan Barrett, Sean Crotty, Tom Looby, Johnny Treen, Shane Kiely, James O’ Riordan, Jack Kiely, Dean Beresford. Next Sunday we play Clashmore in the second round of the under 14 football at home. Training at 6:45 pm Wednesday. There is no camogie this Saturday as it is St. Patrick’s Day. We are walking in the parade on St. Patrick’s Day any girls who are walking with us in the parade meet at Garvey's Coolagh service station at 2.30 pm if you have club colours please wear them also please bring your hurleys. We return to outdoor training on Friday 23rd March. More details to follow next week. Back Row (L to R): S. Whelan, J. Kiely, D. Kiely, B. Hogan, D. Hourigan, E. Griffin, S. Cleary, R. Fives, L. Byrne. Front Row (L to R): S. Feehan, T. 'Cub' Kiely, K. O'Brien, P. Byrne, M. Collins, D. Griffin, T. Kiely. This week's photo shows the first Abbeyside U12 Hurling team to represent the club. It was taken in Tallow before they played the home team in a challenge match in 1968. Our popular Jack the Joker Fundraiser will continue this Sunday night in The Stables Bar where the Jackpot will be €4,256. This week Ray Cliffe was drawn out of the drum but did not find the joker but did win €50 while Jacinta O’Mahoney and Evan Collins won €25. We appeal to all our supporters to continue purchasing the tickets as the funds raised will go towards our ongoing development works at the club grounds. Our club bingo will take place this Sunday night and this Sunday we return to the CBS Hall where the Jackpot is €1,850. On Friday night last our Under 21 Footballers recovered from a very bad start to defeat Clashmore by two points in the Western Championship in Fraher Field. We now play The Nire in the Western Semi Final. TEAM: P. CASHIN, D. DEE, D. HENLEY, B. McCULLAGH, C. HICKEY, M. POWER, N. DEE, M. O’HALLORAN, R. SHEEHAN, S. CROTTY, J. POWER, D. COLLINS, S. O’DONOVAN, R. DUNFORD, E. COLLINS. SUBS: C. KINDREGAN, J. LEACY. On behalf of all in the club we would like to wish Colaistí na nDéise the very best of luck ahead of their All Ireland Colleges Quarter Final against Kilkenny CBS this weekend.. Representing our club on the panel are David and Evan Collins, Brian Looby, Laurence Power and Eamonn Crotty . On Sunday last Waterford Senior Footballers had a fantastic victory over Wicklow in the National League in Aughrim where a number of our players were involved. Mark Ferncombe grabbed three goals in his first game of the year while Garry and Patrick Hurney were also on the score sheet with Sean O’Hare lining out at midfield and Stephen Enright was on the panel. On behalf of all in the club we would like to wish Eoin Brackett and Daryl Ryan the very best of luck as both lads head off to Australia this week. On behalf of all in the club we would like to send our sympathies to the Moore and O’Donnell families on the death of Anne Moore nee O’Donnell last week. Friday 9th March - Indoor Hurling - New members welcome! Coaches will be giving out details over the next week or so regarding this year’s entry into the St. Patrick’s Parade, more details next week. Just to remind everyone that we are still walking every Monday evening at 6.30pm. Participants fill in an envelope at Centra and show whether they wish to contribute to the Juvenile GAA or SERT. The fee is €1 per mile and the walk is from Centra, out the New Line, down by St. Augustine’s College in Duckspool and in the Burgery and back to Centra, which is just about 2 miles, so the cost per walk would be €2. So far, over €600 has been collected for our club, well done and thanks to all..... and keep on walking! Our U16 footballers played Clashmore in the Western semi - final last Wednesday evening at home. This was a good game and at half time we trailed by a point 1-05 to 0-09. In the second half we took our chances when we got them, and in the end that was the difference between the teams, with Ballinacourty running out winners by 3 points in the end. Final Score: Ballinacourty 4-09, Clashmore 2-12. Camogie continues in the Friary every Saturday morning from 11.30 to 12.30 and 12.30 to 1.30 for all other age groups new members are always welcome. We hope to march in the St. Patrick’s Day Parade on March 17th more details to follow. Back Row (L to R): Alan Landers, Johnny Shields, John Mulligan, Pat O'Brien, John Moloney, Nicholas Dwane, Nick Thompson, Jason O'Donovan, Joe O'Riordan (Capt), Bosco Mahony. 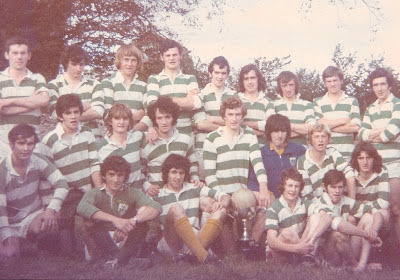 Front Row (L to R): Damien Wall, Joe Thompson, Ollie Keohan, Michael Hickey, Paul Duggan, Jimmy Healy, Jim White, Gerry O'Connor, Michael Collins, Pat Cunningham. 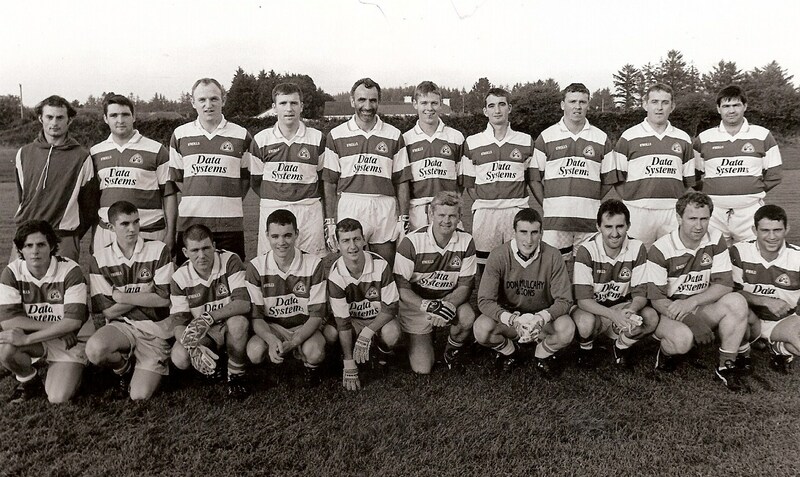 This week's photo shows the Ballinacourty team that beat the Nire, 0-6 to 0-5, to win the Western Junior Football League in 1997 in Touraneena. This year also saw the club win the Western Junior Hurling League, thus completing a rare league double.